The Australian dollar holds positive tone and extends bull-leg from 0.7182 trough into fourth straight day. 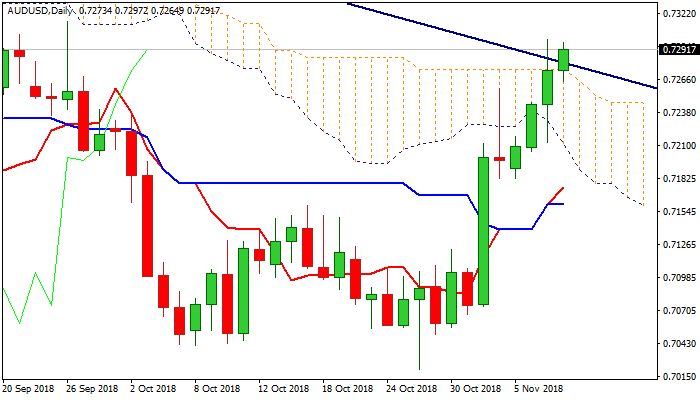 Fresh extension higher offsets fears of rally's stall after bulls spiked 0.7299 (the highest since 26 Sep) on Wednesday but failed to close above daily cloud top and trendline resistance (0.7274/81). Upbeat Chinese Oct Export/Imports data, released overnight, boosted Aussie for renewed attempts above daily cloud and bear-trendline drawn off 0.7988 (11 Feb high) look for final push towards key barrier at 0.7314 (26 Sep spike high). Strong bullish momentum and positive setup of MA's on daily chart supports scenario, as strong bullish signal is expected on close above falling daily cloud, with extension above 0.7314 pivot, needed to confirm base at 0.7050 zone and generate reversal signal. Broken 100SMA (0.7264) is expected to hold and keep bulls intact, while break lower would signal deeper correction.